One of the ultimate challanges for Istanbullers is to get to the Asian side from the European for sure. There are multiple ways to overcome this challange by various vehicles (really various in Istanbul’s case!) but one should decide on which to use according to rush hours, fares, travel durations and other parameters which are all explained below. The main districts on the Asian side are Kadıköy and Üsküdar in which most of the sights are included and also there are many options to travel to other districts. So I will mainly focus on how to travel to these two districts from Sultanahmet and Taksim but will mention other districts on Asian side as well. When in the case of changing continents, the first thing comes to mind is travelling on a ferry in company with fresh Bosphorus air. There are several quays on the Asian side including the two in Kadıköy and Üsküdar. Ferry costs 2,15 TL with Istambulkart and 3 TL with token. There are ferries to Kadıköy, departing from Beşiktaş, Kabataş and Eminönü. From Sultanahmet: The easiest way to take a ferry for Kadıköy is to get to Eminönü first by T1 Bağcılar-Kabataş Tramway. The tramway runs in every 5 minutes and costs 2,15 TL. From Taksim: One way is to take the Kadıköy-Beşiktaş ferry by first getting on a “dolmuş” (yellow minibuses) going to Beşiktaş. The dolmuş costs nearly 2,50 TL. However, it is much cheaper if you take F1 Taksim-Kabataş Fenicular first and then the Kadıköy-Kabataş ferry. The fenicular also costs 2,15 TL. There are also ferries to Üsküdar, departing from Eminönü and Beşiktaş. From Sultanahmet: You can again take T1 Bağcılar-Kabataş Tramway to Eminönü and get on the Üsküdar-Eminönü ferry. From Taksim: You can get on a dolmuş going to Beşiktaş and then take the Üsküdar-Beşiktaş ferry. The fastest way to travel on Bosphorus is to take a motor. There are motors to Kadıköy, departing from Eminönü and Karaköy. They cost 4 TL with Istanbulkart. From Sultanahmet: You can take T1 Bağcılar-Kabataş Tramway to Eminönü and get on the Kadıköy-Eminönü motor. From Taksim: You can take T Taksim-Karaköy Tunnel to Karaköy and then the Kadıköy-Karaköy motor. 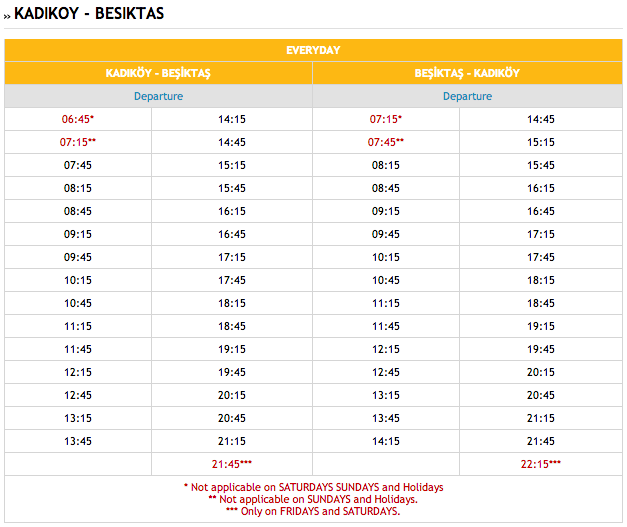 For the timetable of TurYol motors to Kadıköy, click here. *You should prefer Kadıköy (Metro) quay. There are motors to Üsküdar, departing from Eminönü, Karaköy, Beşiktaş and Kabataş. From Sultanahmet: You can take T1 Bağcılar-Kabataş Tramway to Eminönü and then the Üsküdar-Eminönü motor of TurYol. 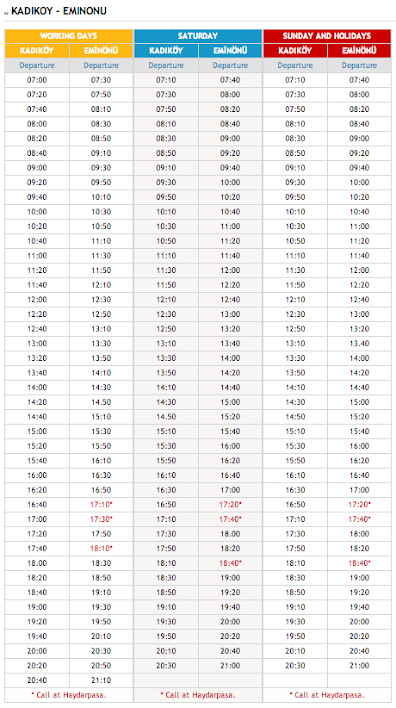 For the timetable of TurYol motors to Üsküdar, click here. From Taksim: You can either take the Üsküdar-Beşiktaş motor by first getting on a “dolmuş” (yellow minibuses) going to Beşiktaş or the Üsküdar-Kabataş motor by getting on F1 Taksim-Kabataş Fenicular. Üsküdar-Beşiktaş motors run frequently between 6.20 a.m. and 01.00 a.m.
Üsküdar-Kabataş motors runs frequently between 07.00 a.m. and 09.00 p.m. and in every 15 minutes until 12.20 p.m. on weekdays. On weekend they start running at 07.15 a.m. Since metrobus began operation in 2007, many Istanbullers have been using it frequently. The metrobus line, called 34Z, makes changing continents very easy –and fast. It runs between Zincirlikuyu and Kadıköy (Söğütlüçeşme is the full name of the Kadıköy stop) and cost 2,65 TL for 4-9 stops. The best thing about it that they work 24 hours a day. From Taksim: Take M2 Taksim-Yenikapı Metro until Gayrettepe stop. After walking for about 300 meters, you will reach to Zincirlikuyu metrobus stop. From Sultanahmet: It is difficult to get to the Asian side from Sultanahmet by metrobus. But if it is late night, you may take a taxi to Zincirlikuyu and then hop on the metrobus as it is always working. Finally I should warn you that metrobus can be very crowded between 5 p.m. and 8 p.m. which is up to point that people are competing with each other to have a seat. Reminder: If you are in Mecidiyeköy, you can take the matrobus, called 34, to Zincirlikuyu and then hop on 34Z. 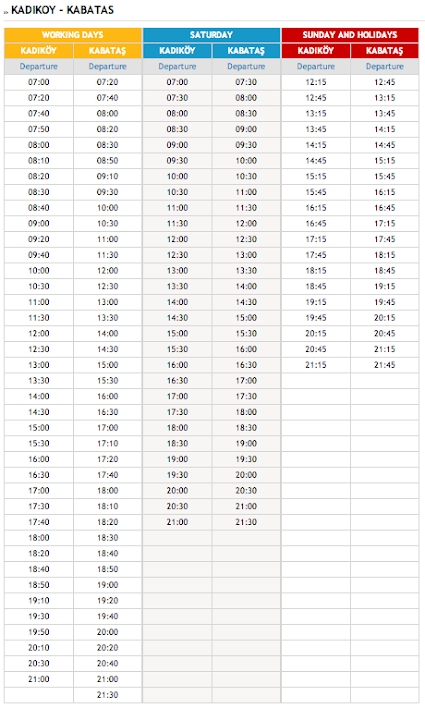 For the timetable of 34Z Metrobus Line, click here. There is one public bus, called 110, which runs between Taksim and Kadıköy. It costs 4,30 TL with Istanbulkart. You can use it any time except rush hours which are 8 a.m.-10 a.m. in the morning and 5 p.m.-9 p.m. in the evening. To go to Üsküdar by 110, you can hop on another bus, written Üsküdar on it, in Altunizade bus stop or take a taxi which will cost little as centre of Üsküdar is very close to Altunizade. For the timetable of 110, click here. Dolmuş may be the savior of Istanbullers who need to change continents in late night –but it may also become the curse of them in rush hours, which are mainly 8 a.m.-10 a.m. in the morning and 5 p.m.-9 p.m. in the evening as mentioned before. Taksim-Kadıköy dolmuş line run 24 hours a day and costs 5,5 TL. They depart from the left side of Atatürk Cultural Centre (AKM). If you want to go to Üsküdar, you can get off the dolmuş in Altunizade bus stop and take a bus, written Üsküdar on it, or taxi basically.